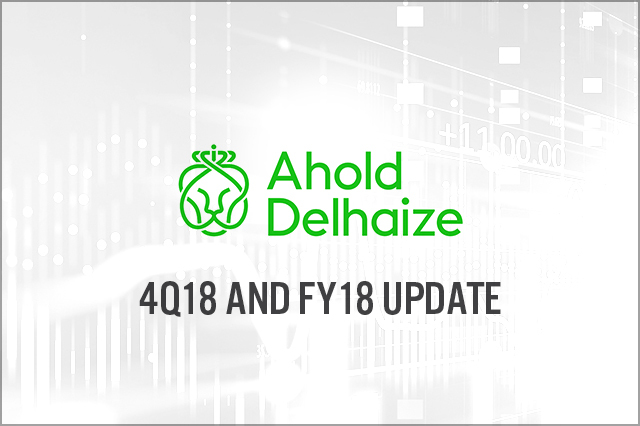 In 4Q18, Ahold Delhaize reported net sales of €16.5 billion, up 3.0% at constant exchange rates, roughly in line with the consensus of €16.48 billion recorded by StreetAccount. The Netherlands posted comparable sales growth of 3.3%, while the U.S. grew comparable sales by 2.7%. Ahold Delhaize reported FY18 revenues of €62.8 billion, up 2.5% year over year on a constant-currency basis. The company expects FY18 EPS to be at the upper end of its guidance range, driven by its strong fourth quarter performance.